Blue Zones Project is a community-wide well-being improvement initiative to help make healthy choices easier in Hawaii. Blue Zones Project engages communities to transform local, county and statewide policy to create lasting sustainable well-being improvement. Blue Zones Project focuses on the three policy areas of built environment, food policy, and tobacco policy. Each policy area has an established target designed to build upon the good work taking place, achieve meaningful change, and recognize the scale, geographic boundaries, and other unique characteristics of Hawaii. The Hawaii Medical Service Association (HMSA) has brought Blue Zones Project® to Hawaii to transform our state into an even better place to live, work, and play. To reach that goal, we’ll help residents make small changes so we can all enjoy longer, happier, and healthier lives. Small changes can lead to big benefits for our community: lower health care costs, higher productivity, and ultimately, a better quality of life. We look forward to working together with organizations, communities, and people across the state to make well-being a priority. Several Elected Representatives are sponsoring an Aiea -Pearl City Town Hall meeting to provide information on the immediate and log term plans to preserve and enhance the Pearl Harbor Historic Trail. See flyer for more information. Music in the Park is a nice way to enjoy a Sunday afternoon here in West Loch Fairways! We were entertained big time with the talents given to us by the Band of the Pacific joint Base Pearl Harbor/Hickam group called “Hana Hou”. It was a one hour blast of upbeat music. The band’s back drop, stage and seating were set up by your WLF Board members: Tom Hiltner, Michael Nii, and Richard Ashley and my family. Tom and his wife lugged a 10×20 foot tent from their home, and set it up so that older residents could sit comfortably on chairs and be out of the sun. Michael my son and our daughter-in-law Kathy helped hold the 19×9 foot flag while Richard and my husband secured the flag. They also helped setting-up and taking down 75 chairs and three tables. I must give special acknowledgment to the support and patience my husband Larry! He always goes out of his way to do the things a 5”1” old lady cannot do, either too weak or too short for the task. The WLF Site Manager delivered fliers to various homes as his time allowed, and also is the one who posted the banner and notice on the Bulletin Board. All of these people are responsible for making this event successful. I appreciate them all, and everyone who attended. We will continue to come up with more Association Events aiming to please and hoping to generate participation from our Membership. Always interested in your thoughts about bringing our community together. 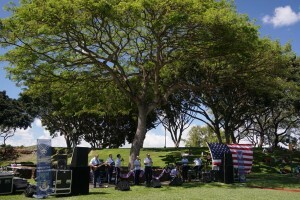 Bring your blankets and picnic eats and enjoy great LIVE music provided to us by a group of musicians from the Air Force Band of Pearl Harbor/Hickam called Hana Hou. 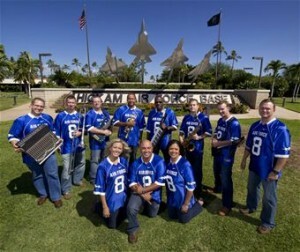 This is to kick off the celebration of Flag Day, and this group we will hear is very, very entertaining, they play everything from rock to top 40’s hits as well as Hawaiian and Patriotic. It is a mixture of brass, guitar, drummers and even a female vocalist! Some chairs will be provided also, but you may just want to lay back on your blankets and relax.